DMK leaders have begun day-long fast in Chennai to draw the Centre's attention over the Mullaperiyar issue. The leaders were protesting against Kerala's demand on building a new dam. Tamil actress and DMK leader Khusbhoo was also taking part in the agitation. "This fasting is for the Mullaperiyar Dam. We want to send across a message that Mullaperiyar is safe. We are equally concerned for the people of Kerala and Tamil Nadu," Khushboo said. A human chain in five districts receiving water from Mullaperiyar dam is scheduled on wednesday, December 14. Tamil Nadu Chief Minister Jayalalithaa on Sunday announced that a special session of the assembly will be convened on December 15 to pass a resolution that the state will not give up its rights over Mullaperiyar Dam in Kerala because of the "imaginary threat to its safety." 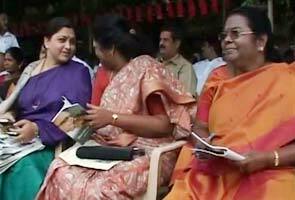 0 Response to "Mullaperiyar: Khushboo joins DMK fast"